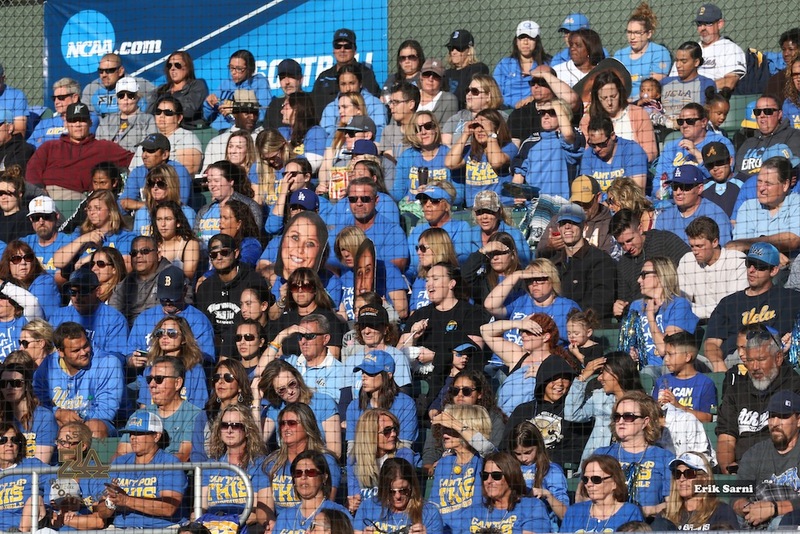 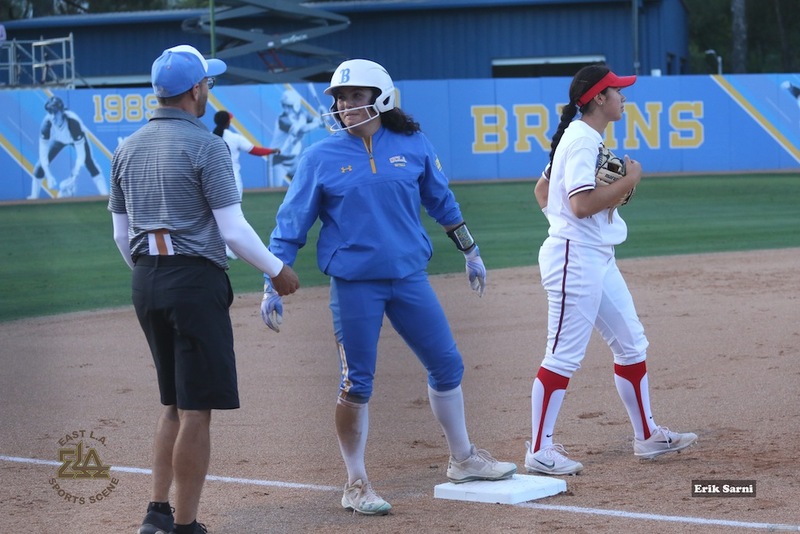 (Westwood, CA) On Friday, May 25th, the #3 seed UCLA Bruins picked up where they left off in Thursday’s, May 24th, Game 1 of the L.A. Super Regional, as they played small ball to sweep the #14 seed Arizona Wildcats in the Best of Three. 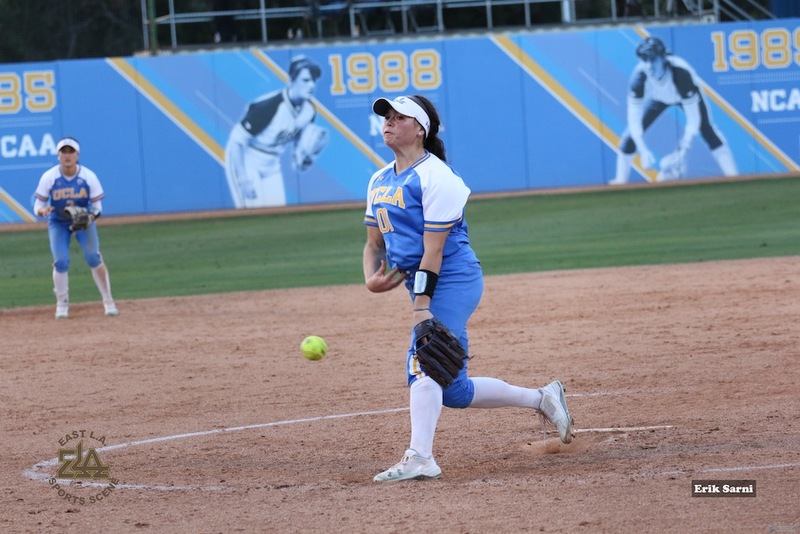 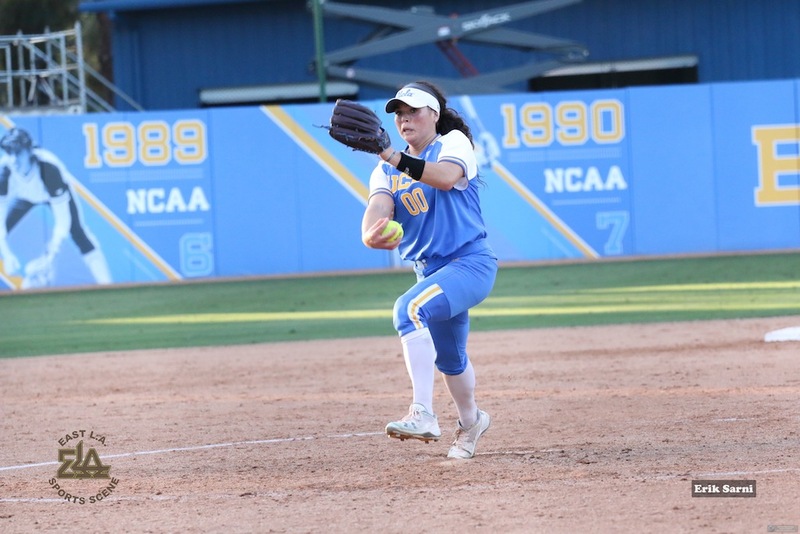 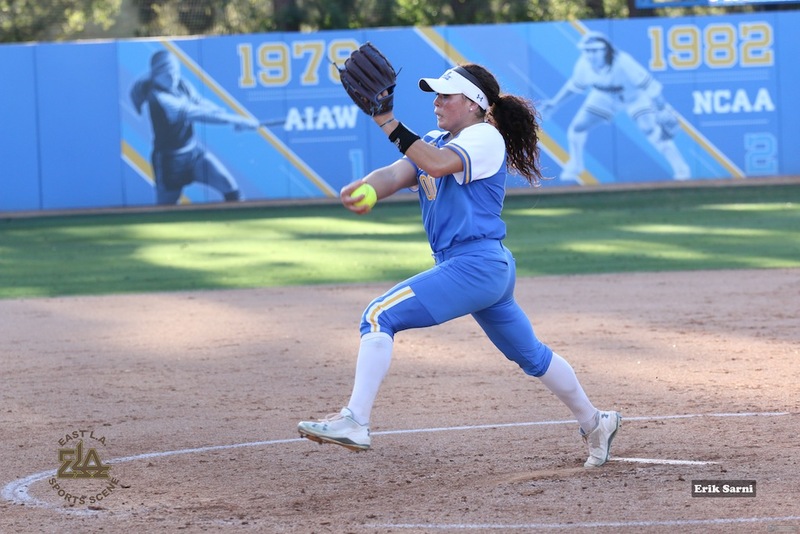 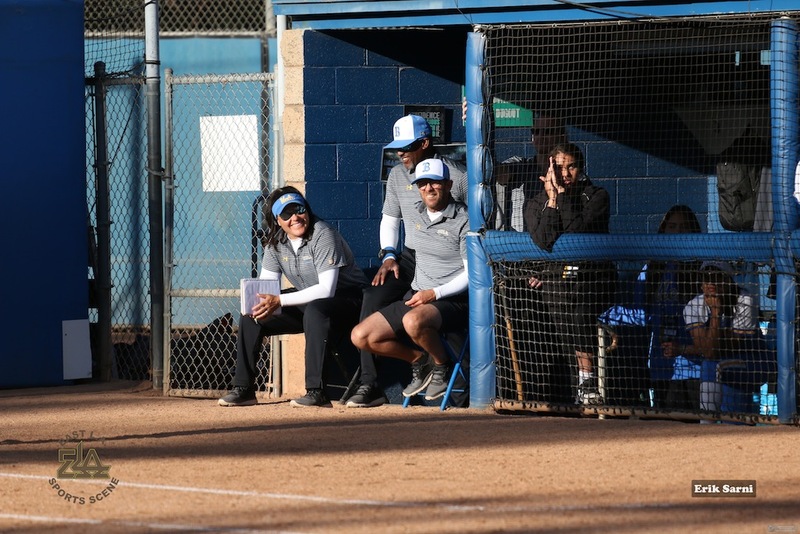 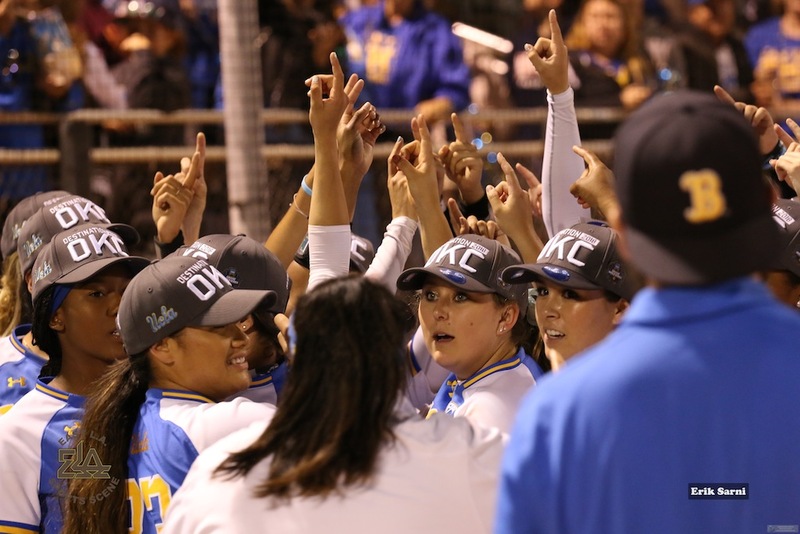 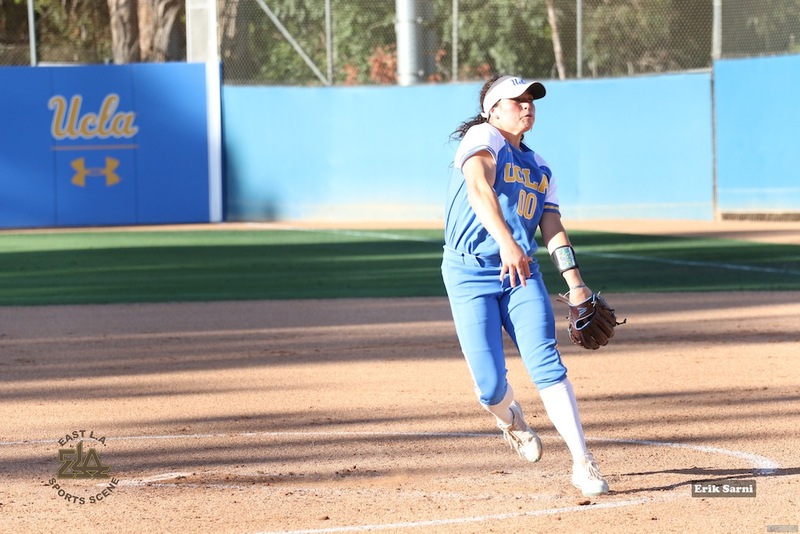 This Regional ended with another convincing pitching victory for PAC-12 Player of The Year, Rachel Garcia, as she used her pitching prowess and hitting skills to lead the Bruins to their 4th consecutive trip to the NCAA’s Womens College World Series, starting today in Oklahoma City. 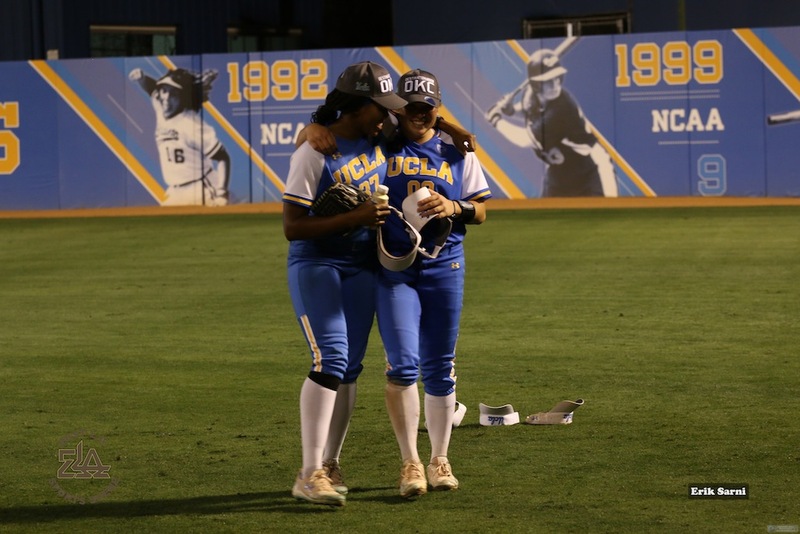 Brief Super Regional Game #1 Summary: Home Run, Home Run, and one more Home Run. 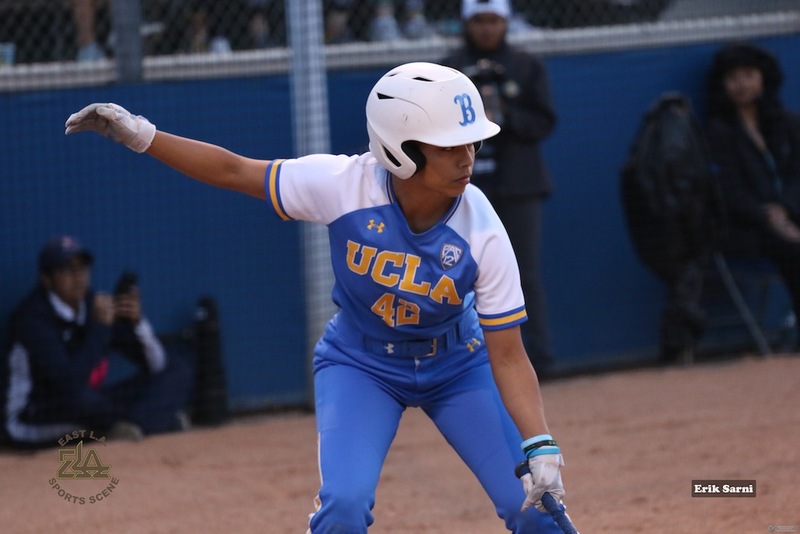 Credit the big bats of Kylee Perez, Madeline Jelenicki, and Rachel Garcia for delivering the long ball against Arizona southpaw starter, Taylor McQuill. 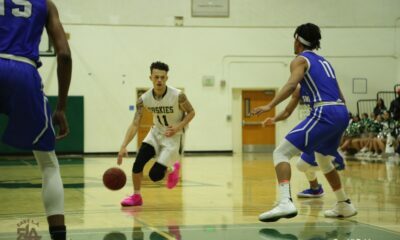 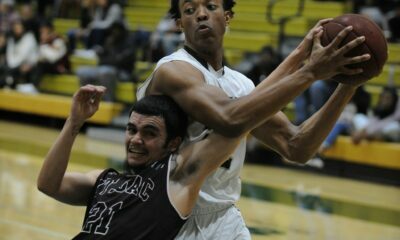 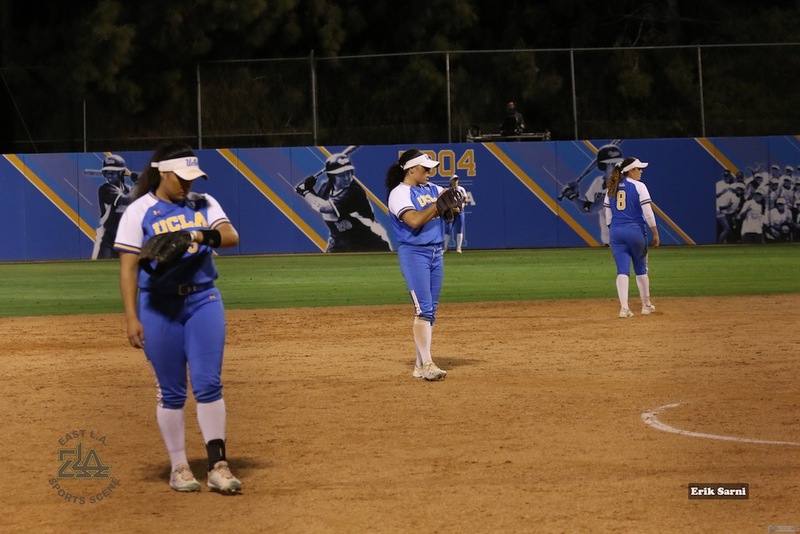 They accounted for all 7 Bruin runs with their powerful strokes. 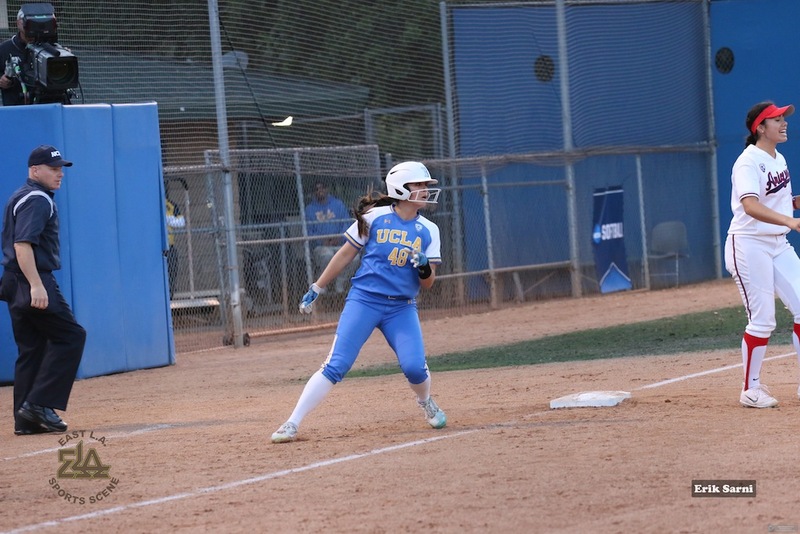 Perez (#6) hit hers in the 2nd. 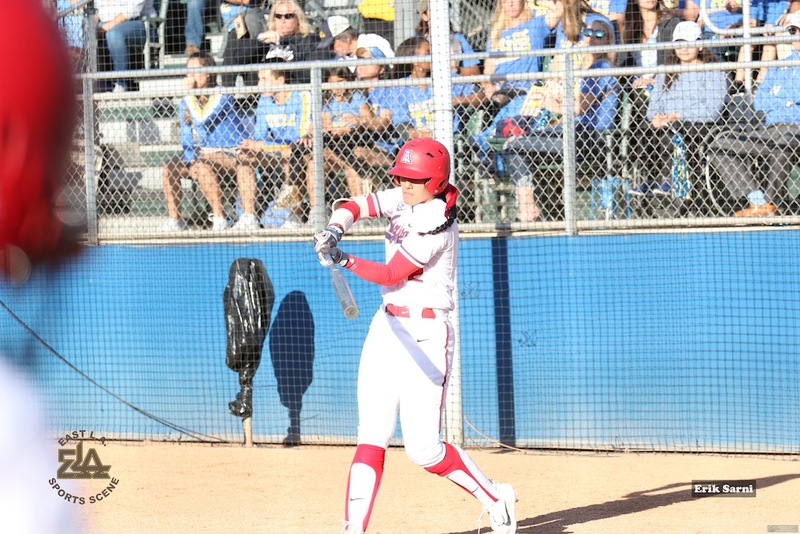 Jelenicki hit her first (#7) in the third, and her second (#8) in the 5th. 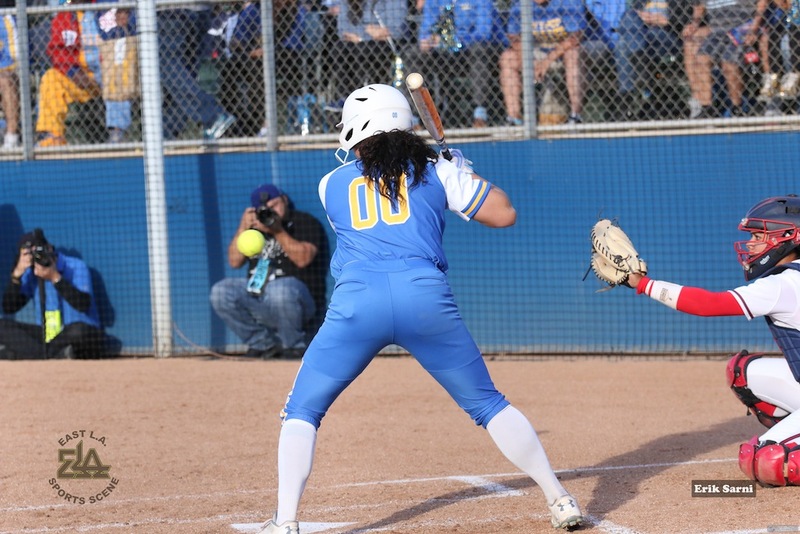 Garcia (#11) slammed hers, a two-run blast to dead center, in the 6th. 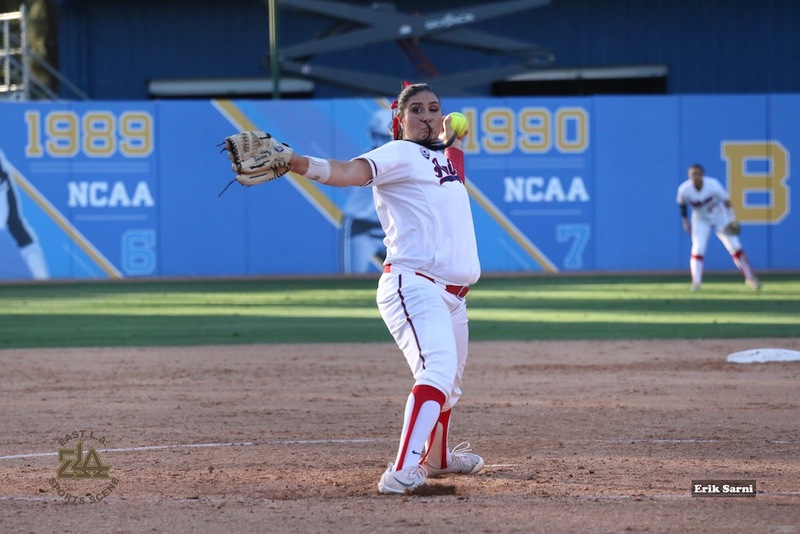 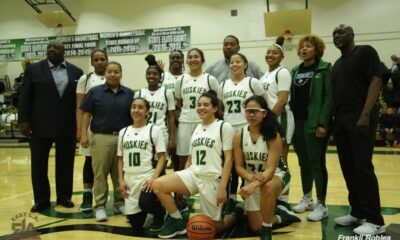 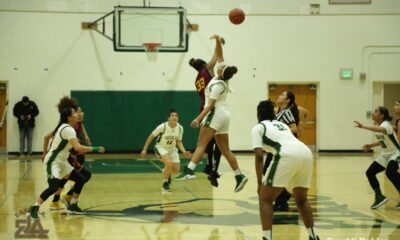 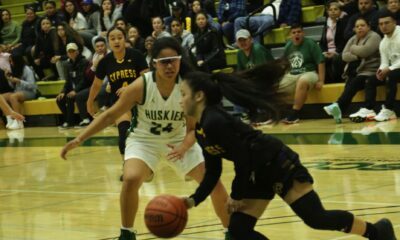 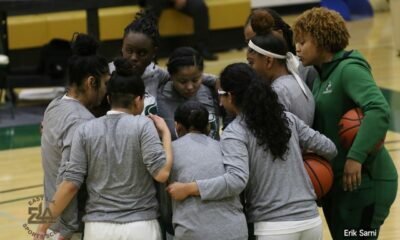 Garcia also was credited with the win and moved her record to a highly credible (26-3), one of the best in the country. 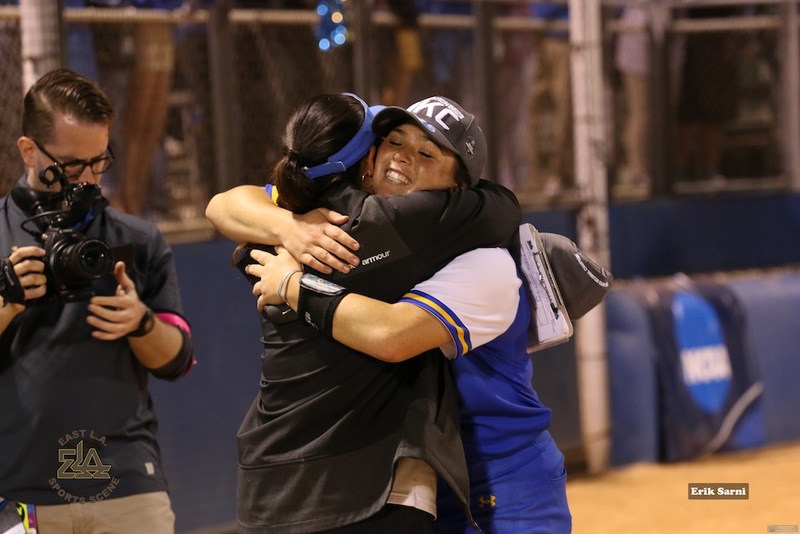 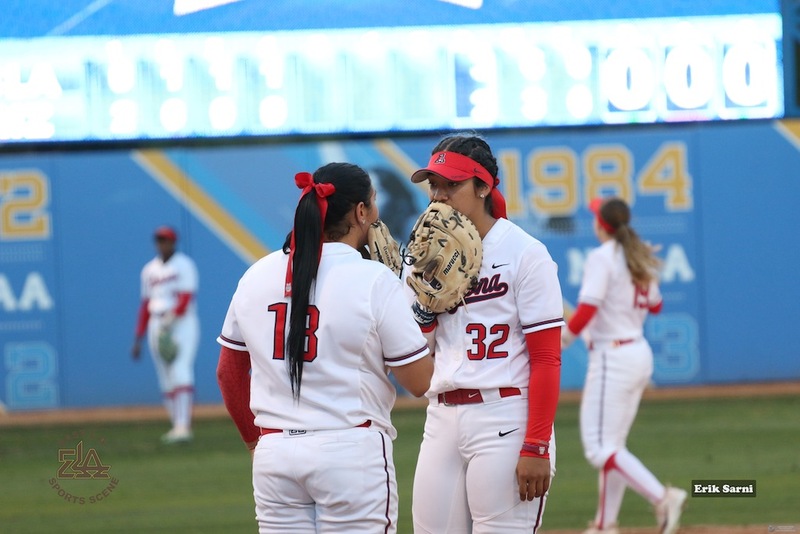 Head Coach Kelly Inouye-Perez pulled her from the mound in the 6th and brought in Freshman, Holly Acevedo to close the game out. 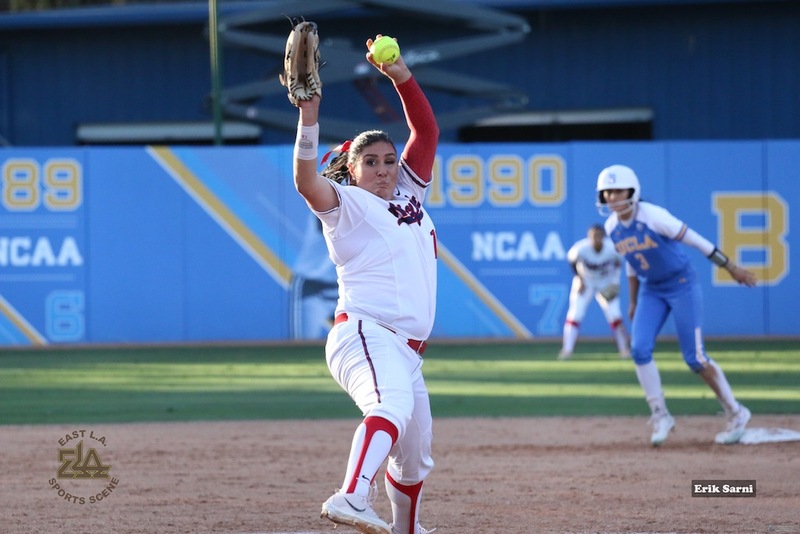 Garcia recorded only 70 pitches in her effort. 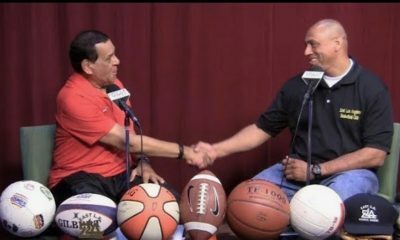 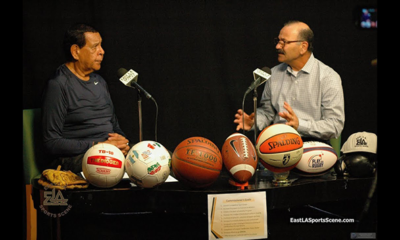 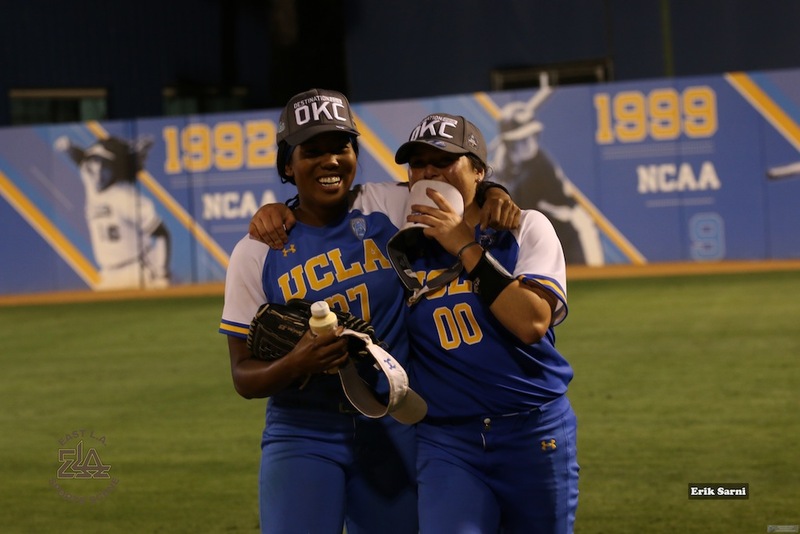 This also gave Acevedo some much-needed playing time in a Super Regional while gathering valuable playoff experience before a national fan-base in a televised game on ESPN. 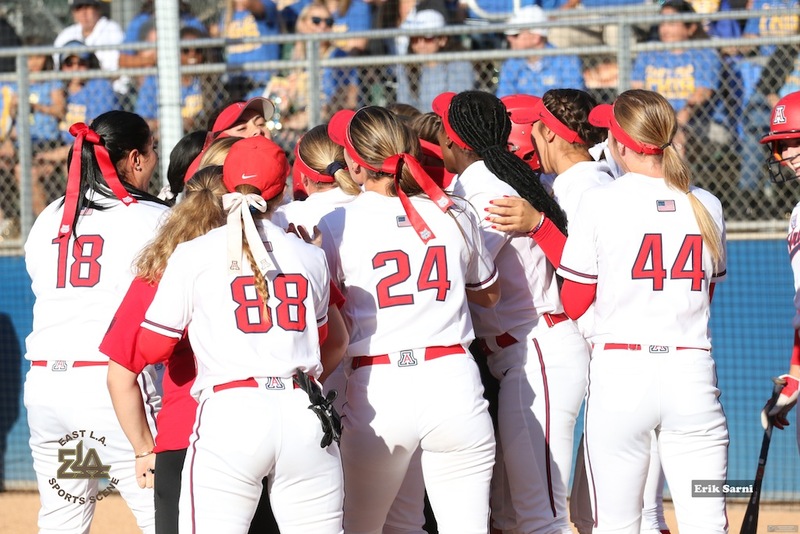 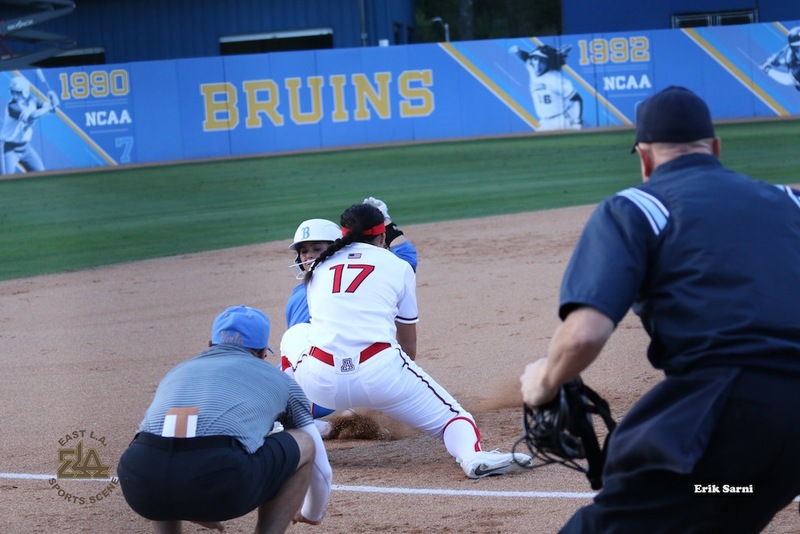 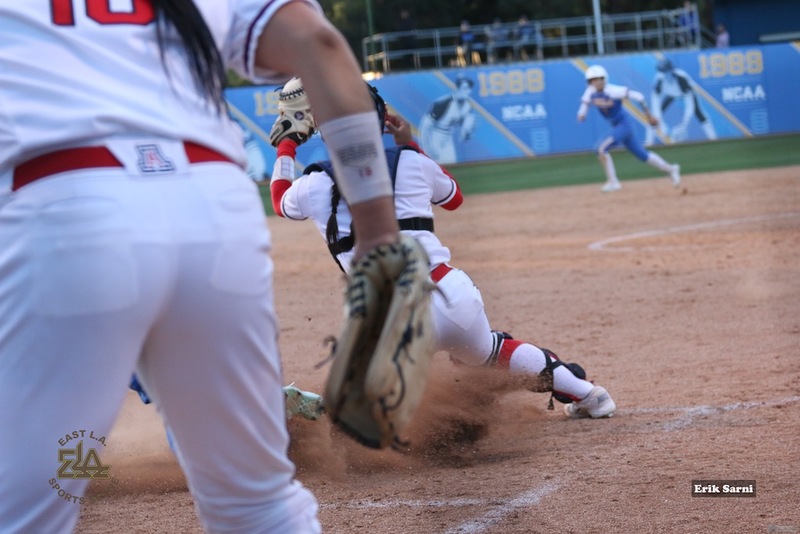 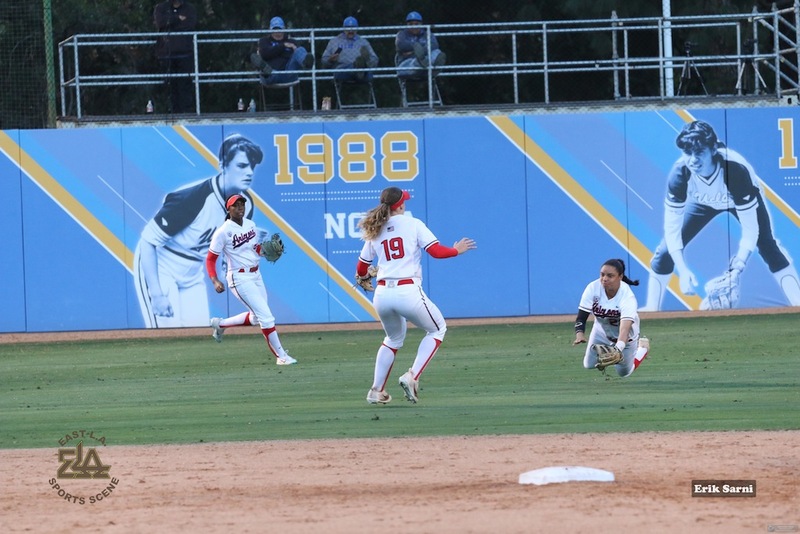 Brief Game #2 Summary: (With Photo Gallery) This time the Wildcats were the designated home team, while the Bruins became the visitors in Easton Stadium for the 2nd time in these two NCAA Regionals. 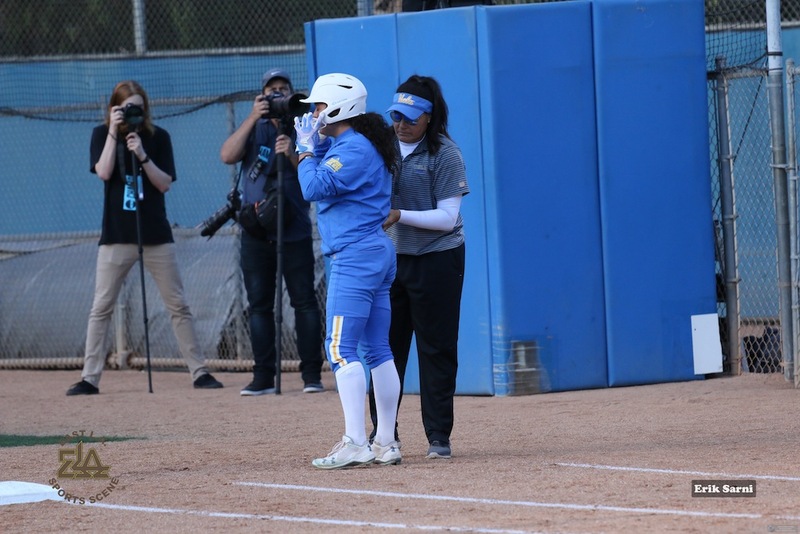 The Wildcats opened the scoring in their first at-bats with their long ball as 1B Alysssa Palomino unloaded a 2-run homer to deep right. 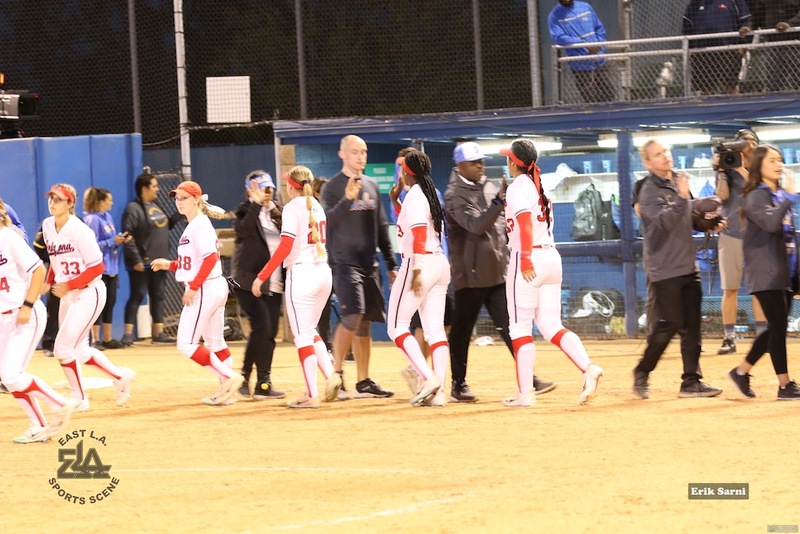 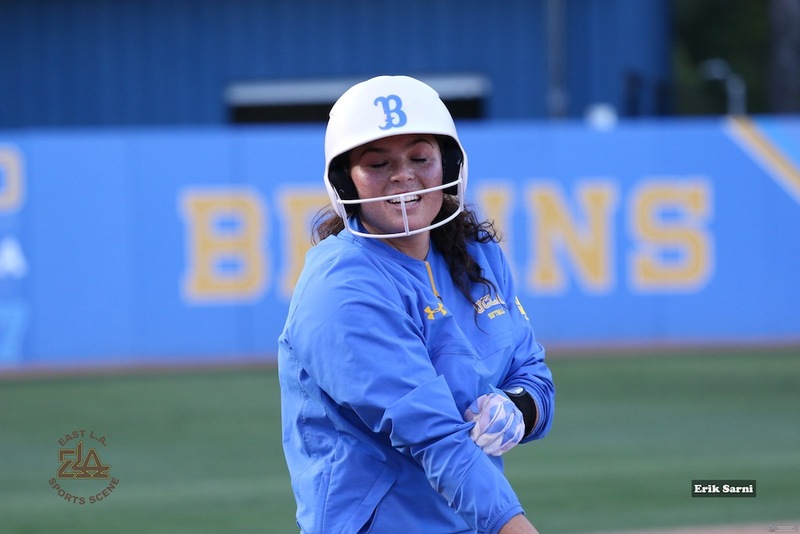 The Bruins chipped away in the 2nd & 3rd innings as they put up a run in each frame to tie the game. 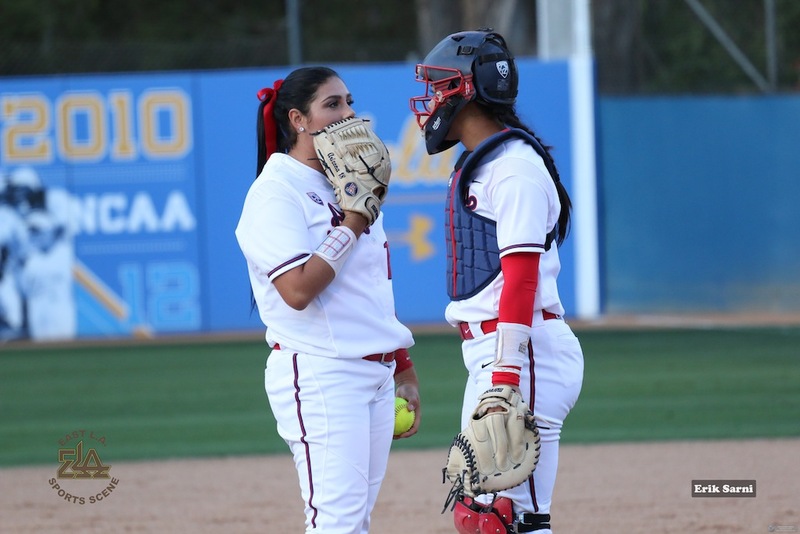 Starting pitcher, Rachel Garcia began to lock down her groove and blanked the Wildcats with no runs in their second and third innings. 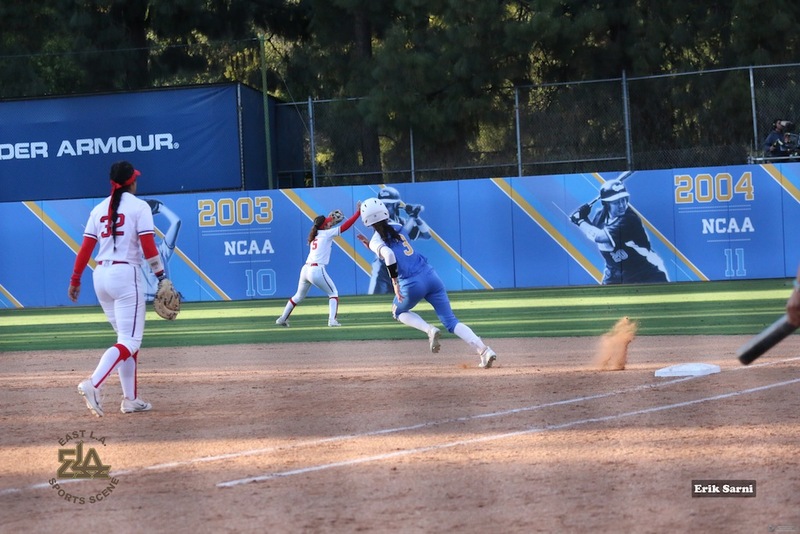 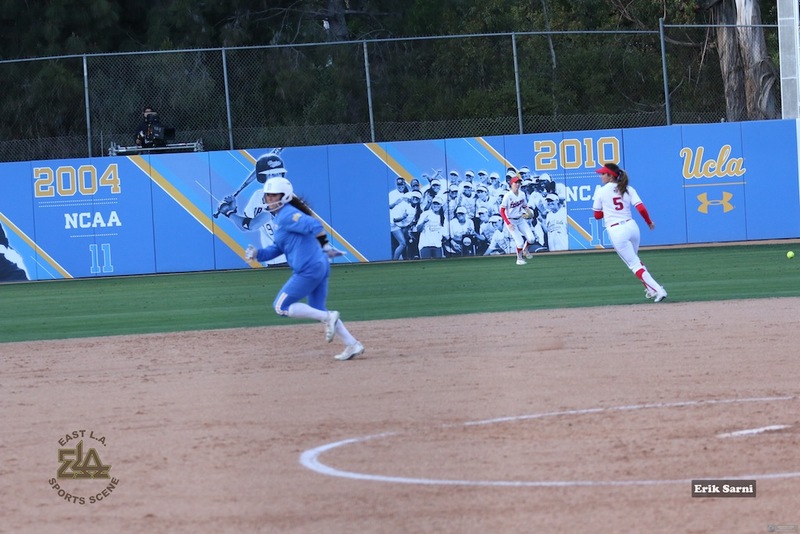 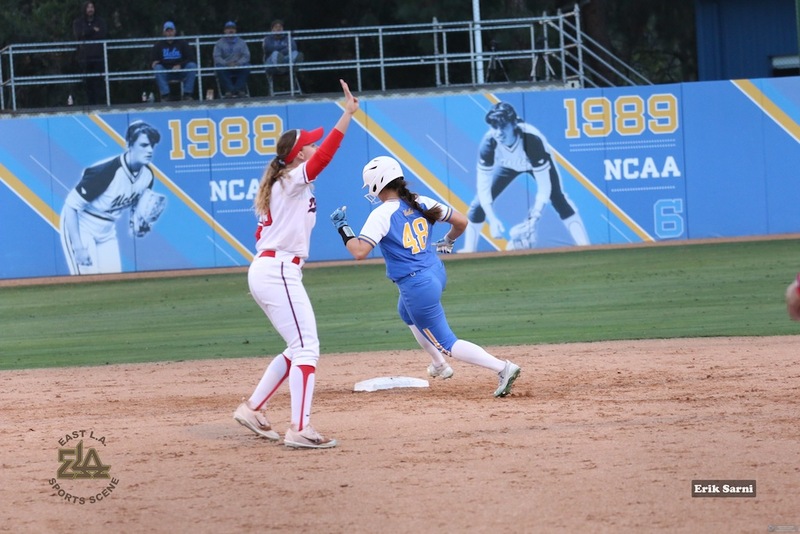 Then, in the Bruin fourth, and with two-out, they managed to plate their third run of the game. 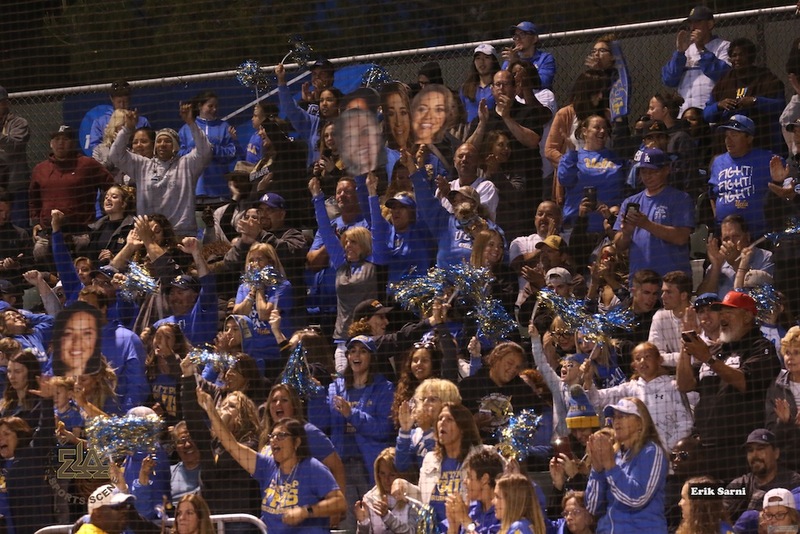 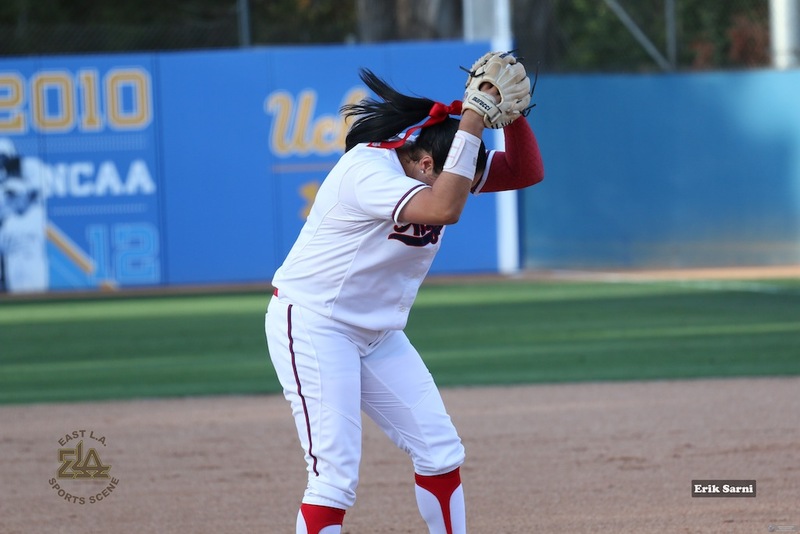 This occurred when Kylee Perez got on base with an infield single. 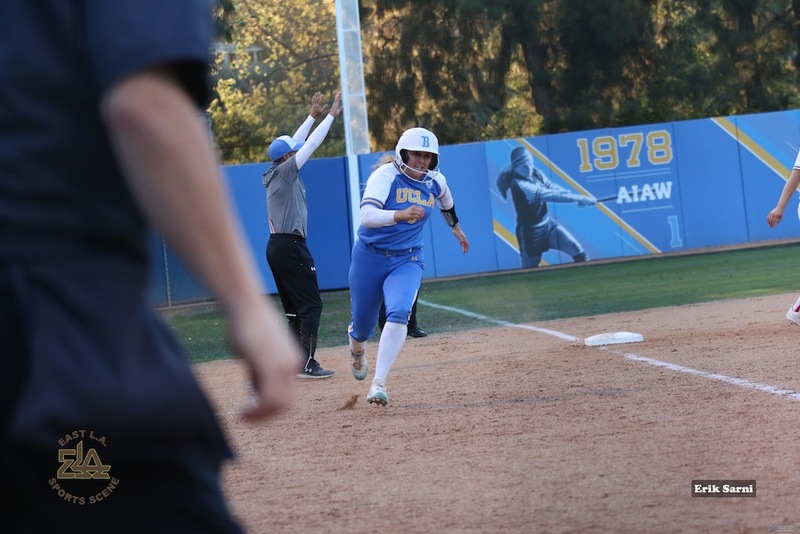 Then her younger sister, Briana, stroked a single putting runners on first and second. 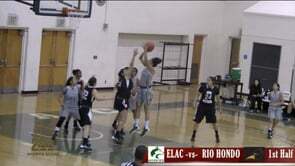 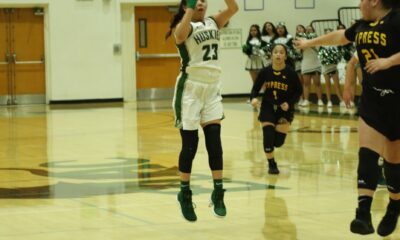 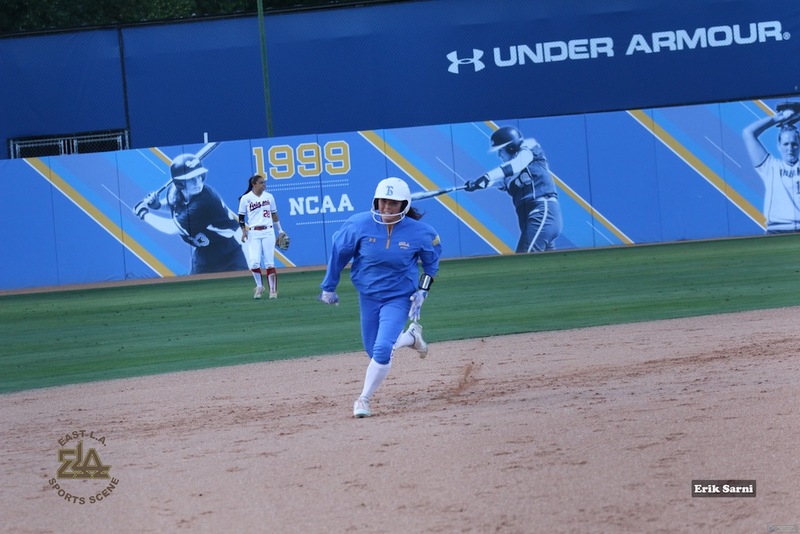 Designated Player, Aaliyah Jordan then singled in Kylee for run number 3. 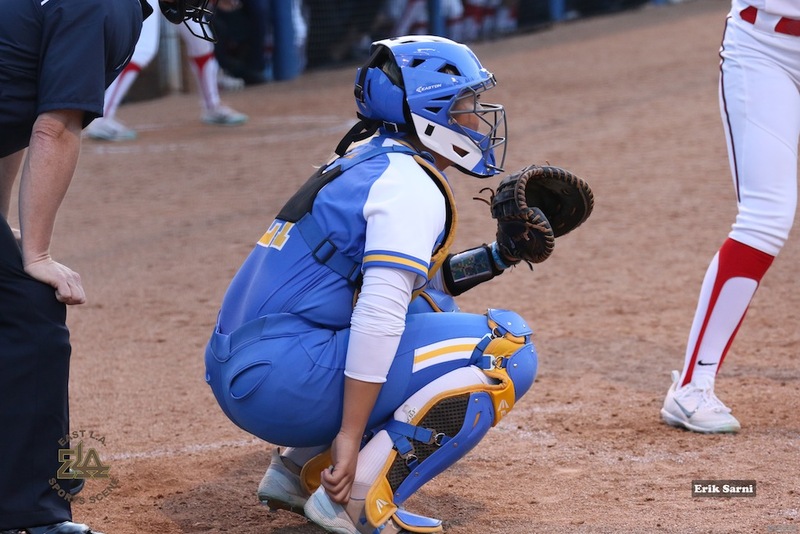 Garcia would pop-up to the catcher to end the inning. 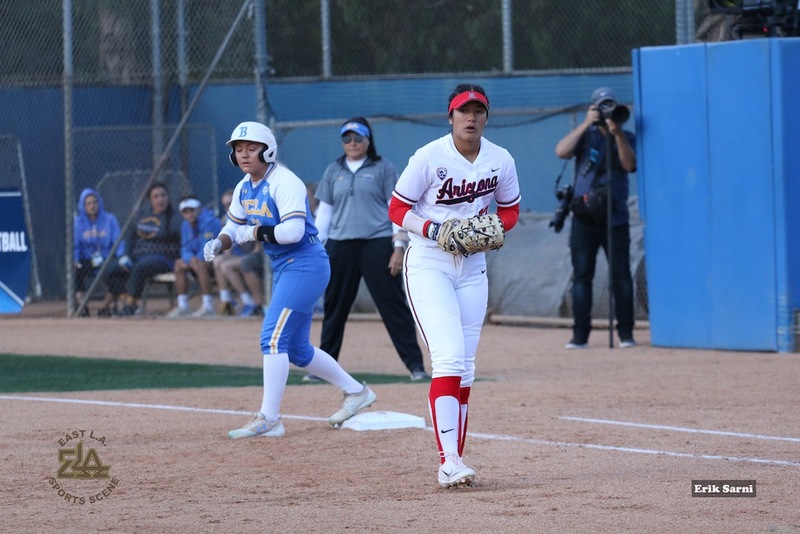 Taking a 3-2 lead at this point, Garcia, perhaps sensed that she could make the one run stand for a probable victory. 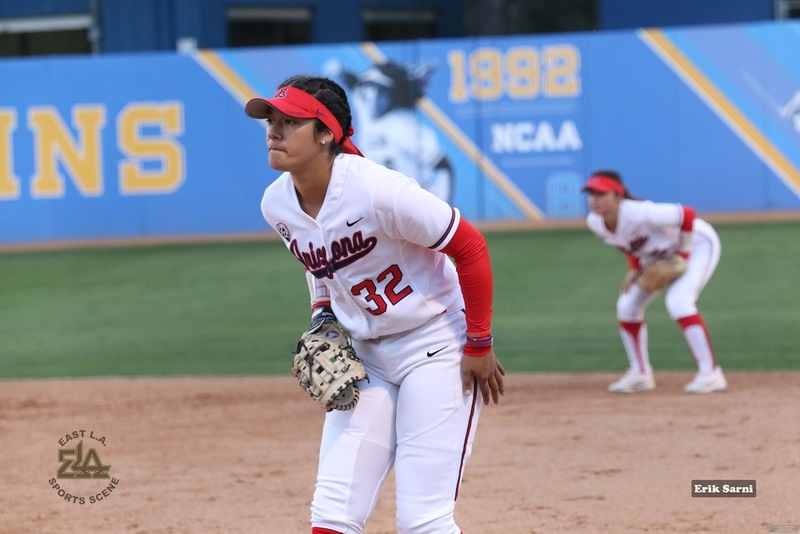 If she did have this thought in mind, she proceeded to methodically shut out the Wildcats for the remainder of the game, while retiring the last 7 batters in a row to secure the win. 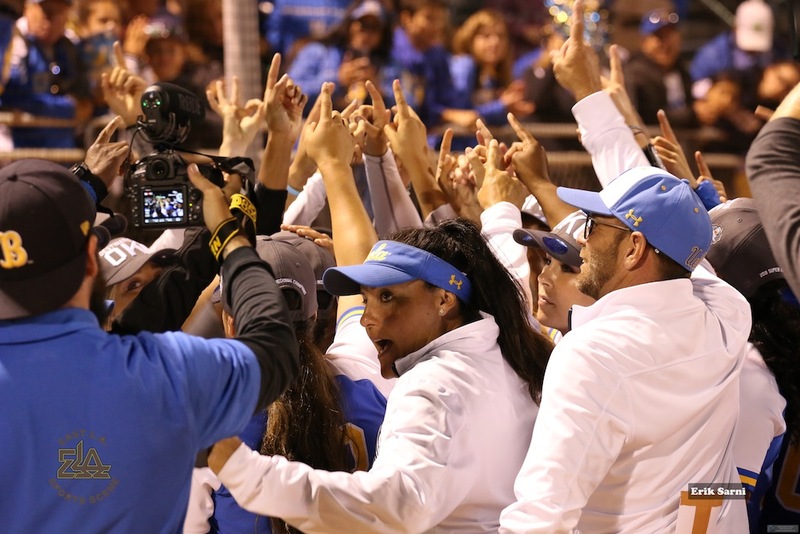 With the victory, Garcia’s record moved to an impressive (27-3). 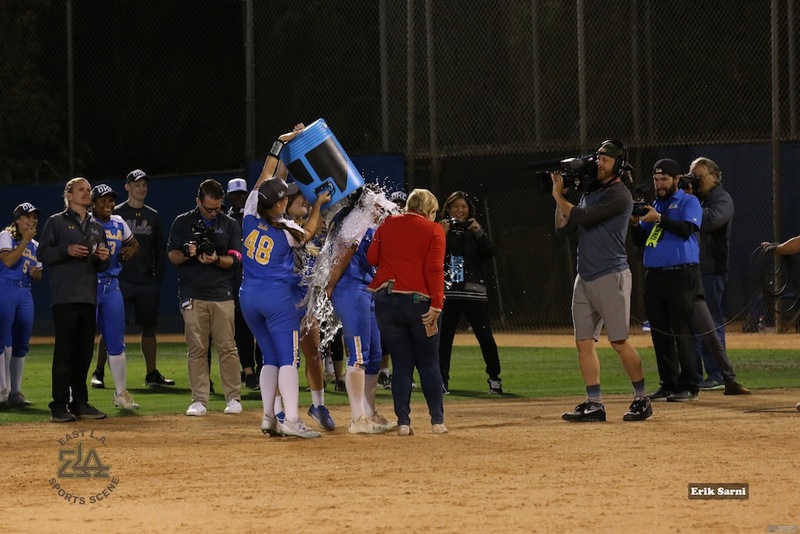 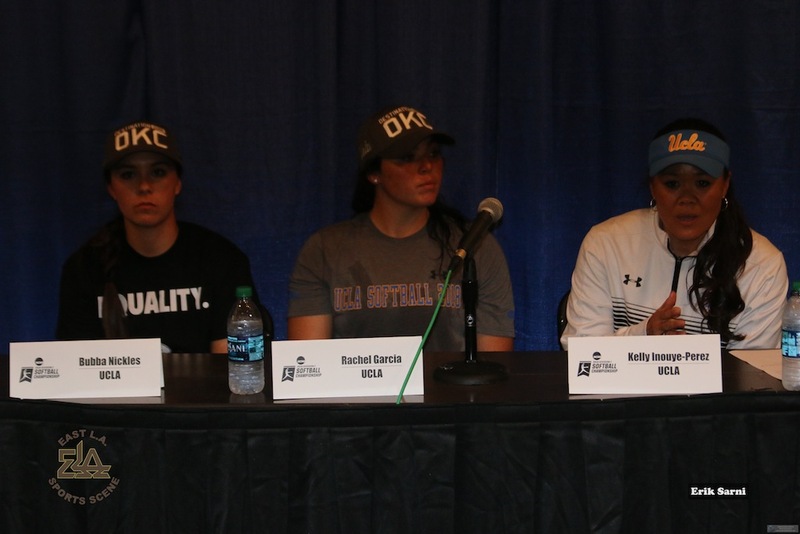 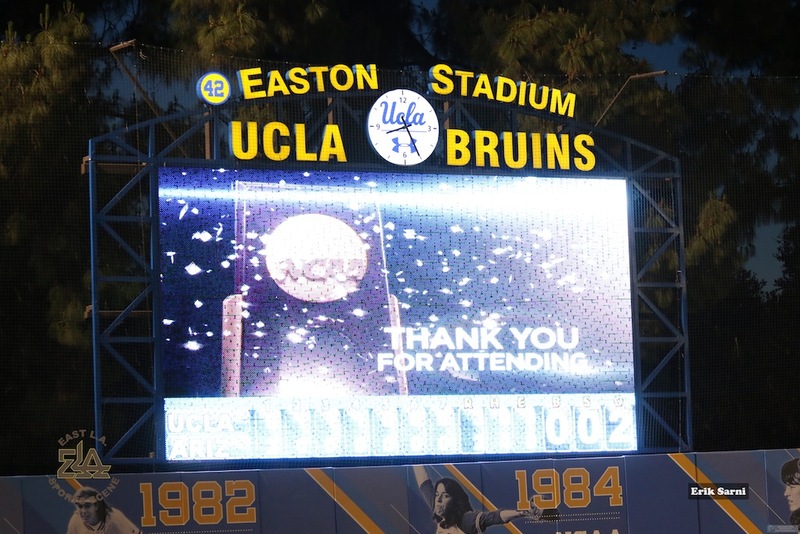 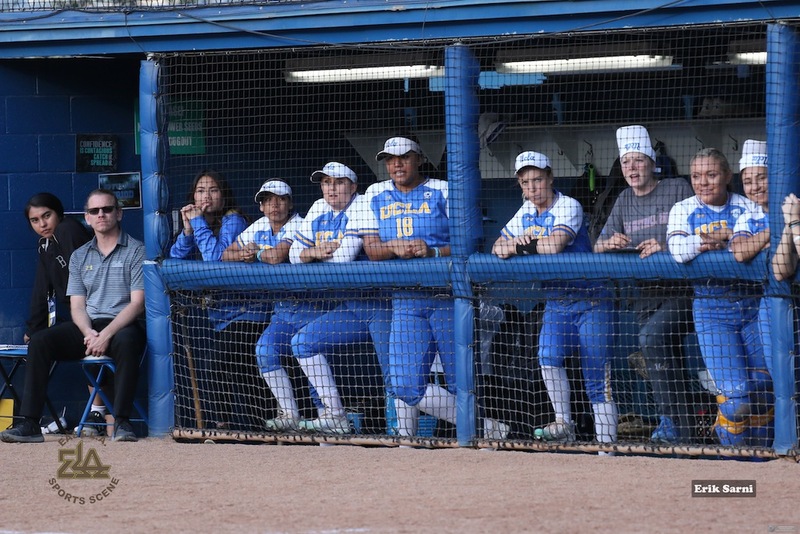 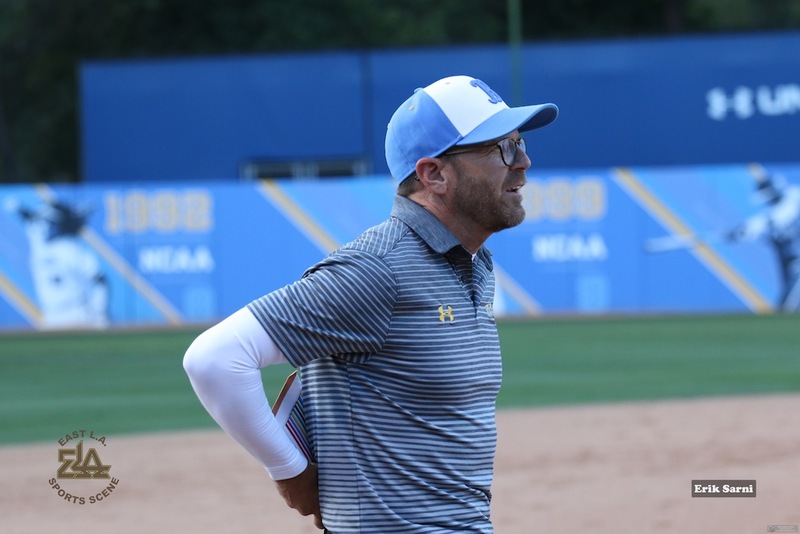 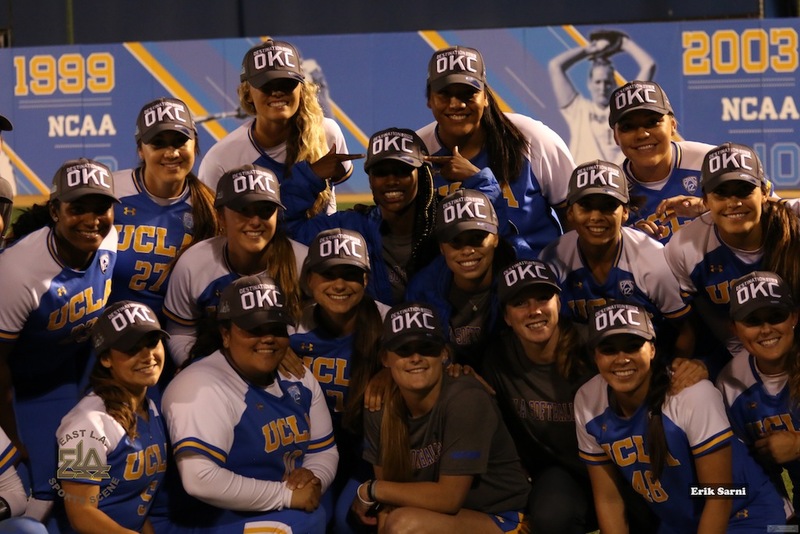 This automatically earned the Bruins the right to become one of the eight teams set for the WCWS, double elimination tournament, beginning on May 31st and lasting through June 6th. 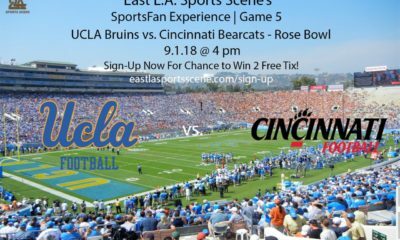 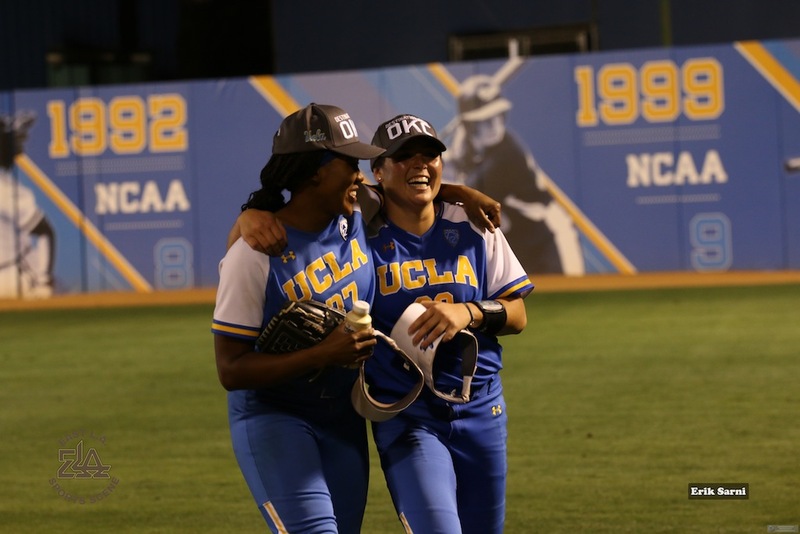 Follow the Bruins here on their quest for the Championship. 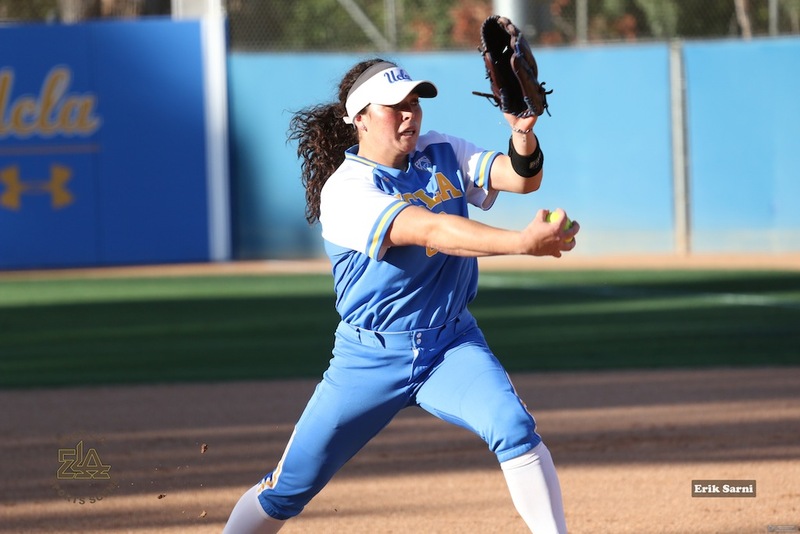 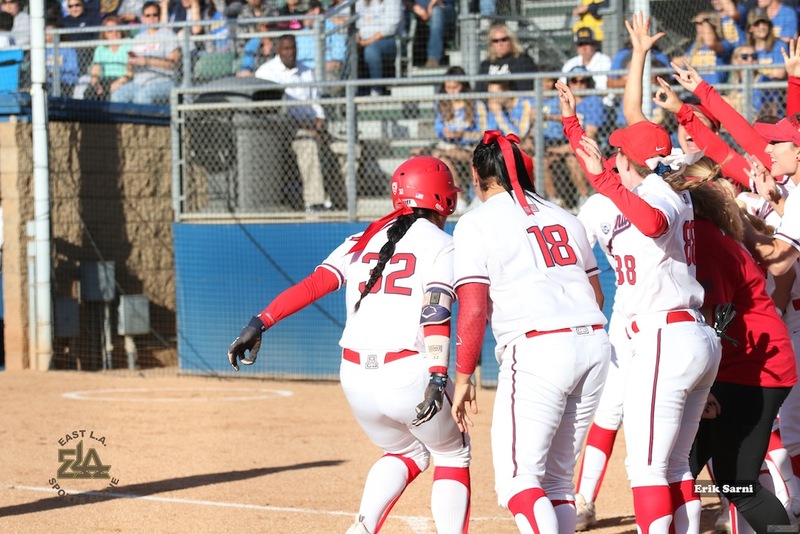 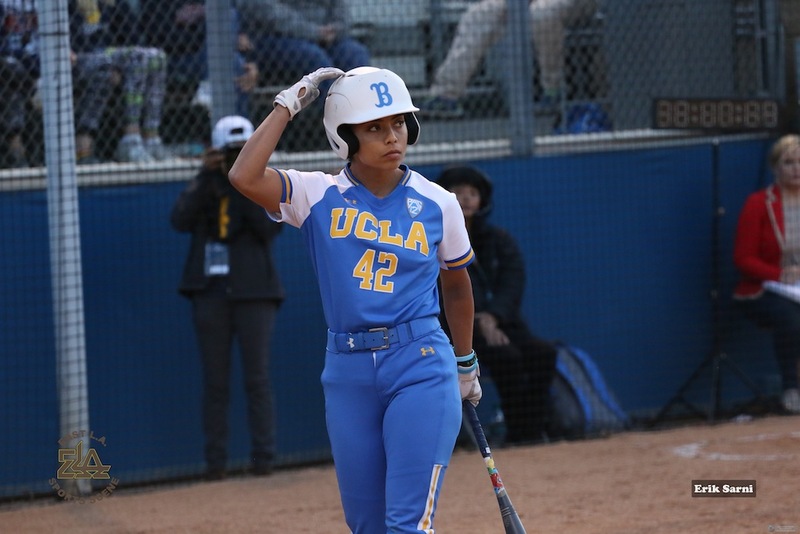 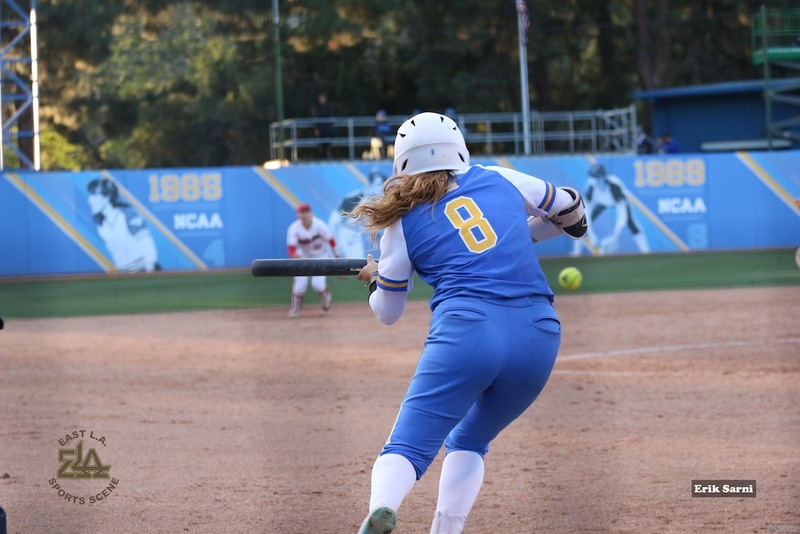 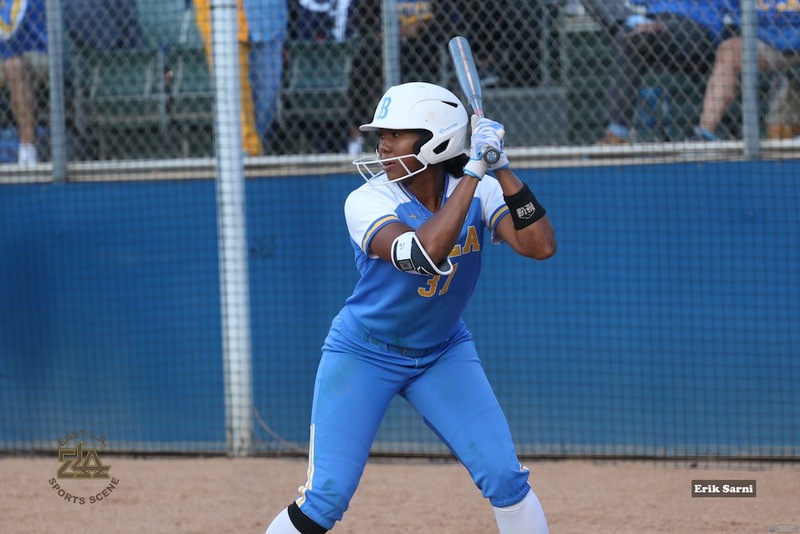 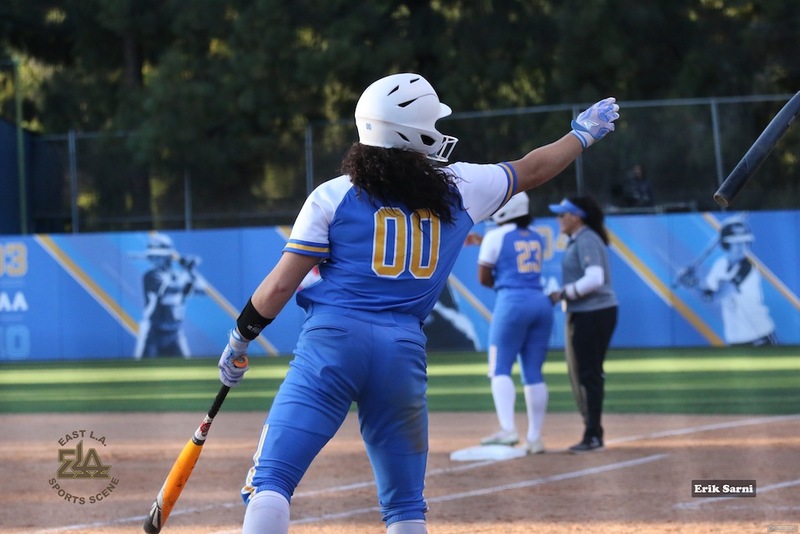 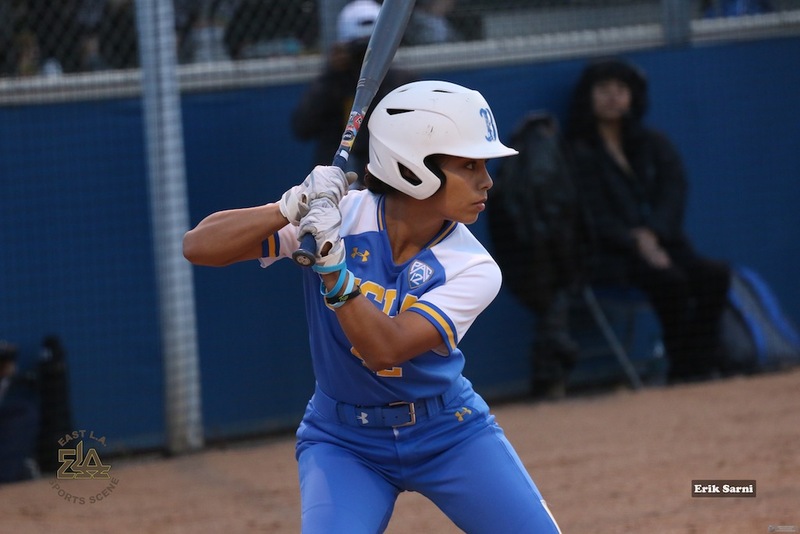 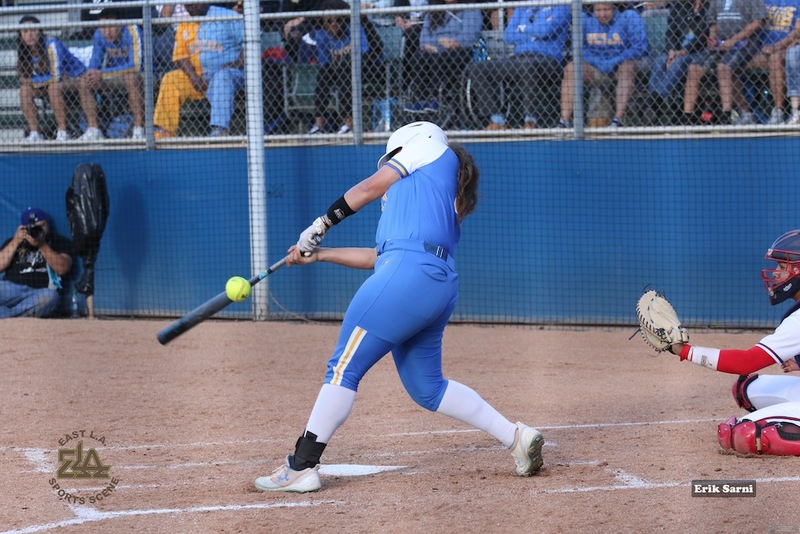 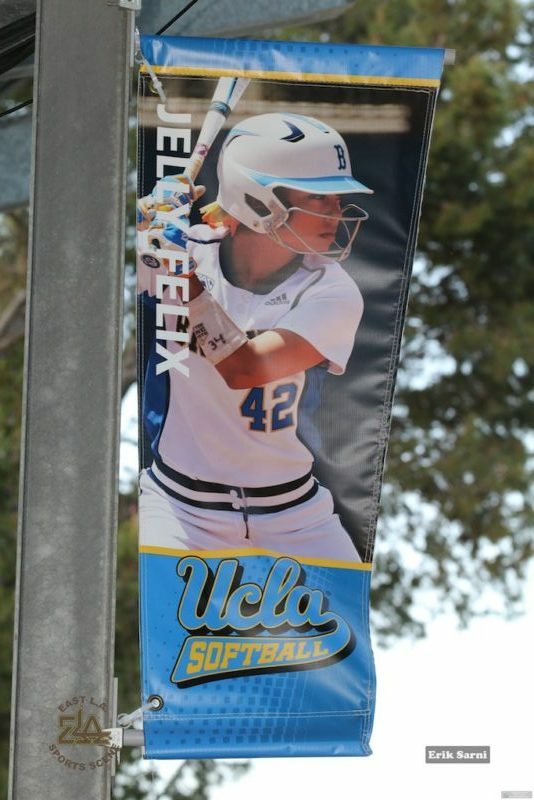 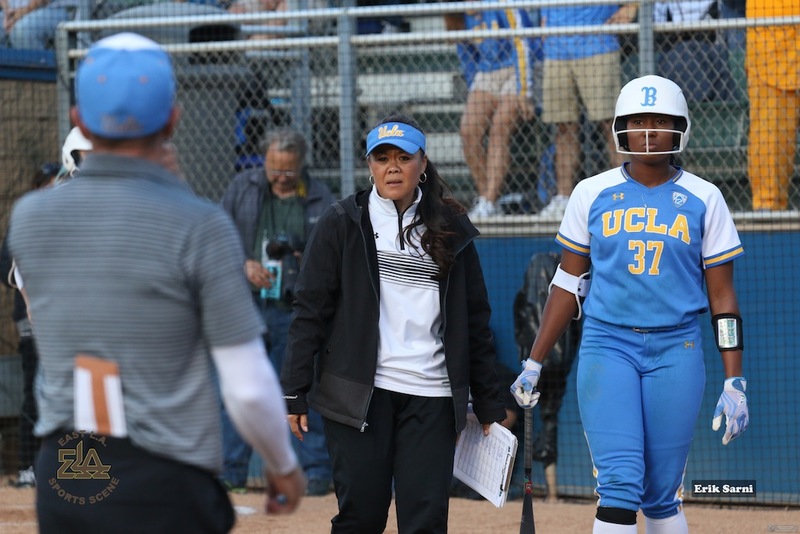 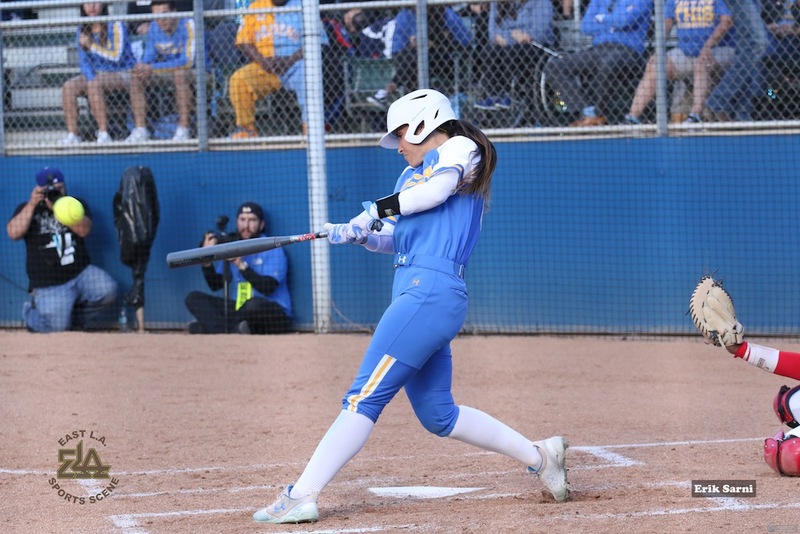 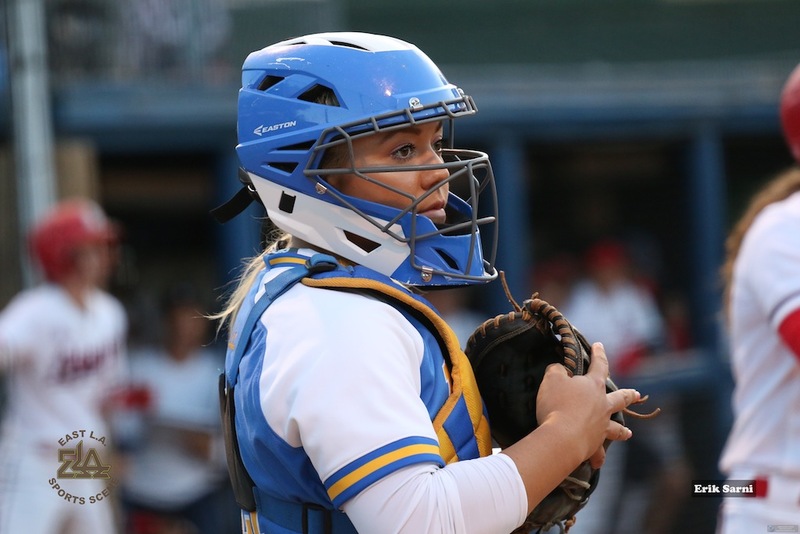 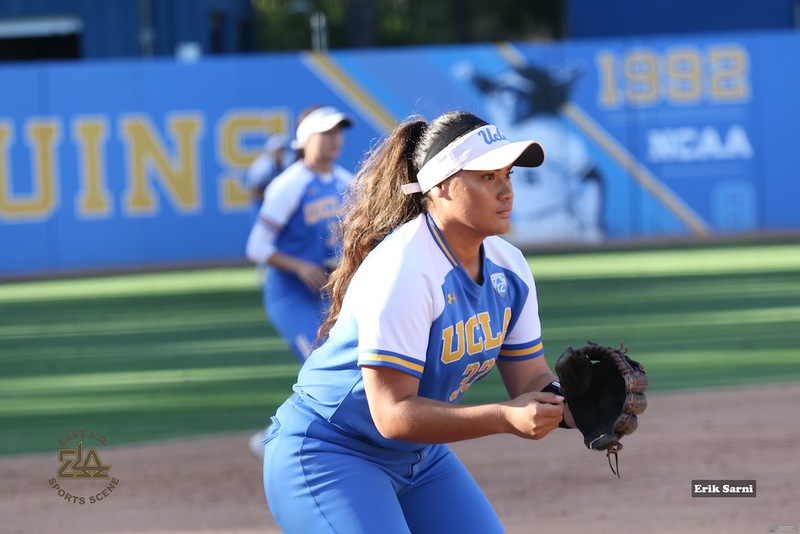 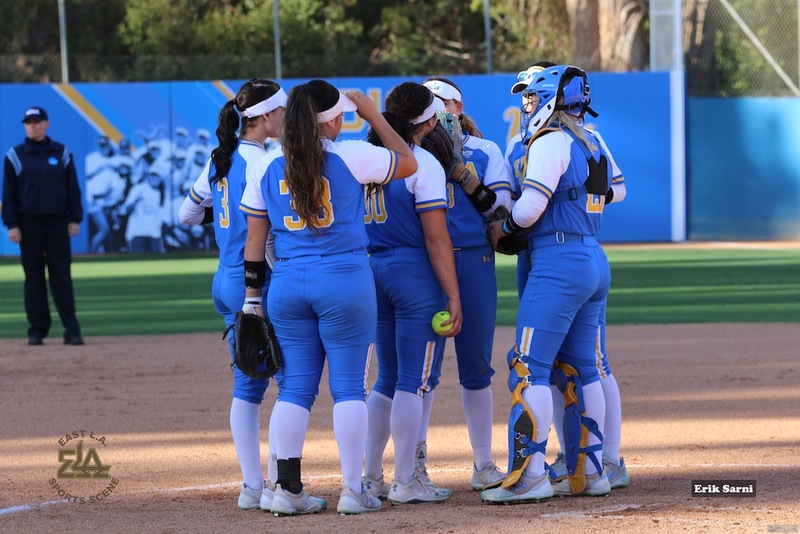 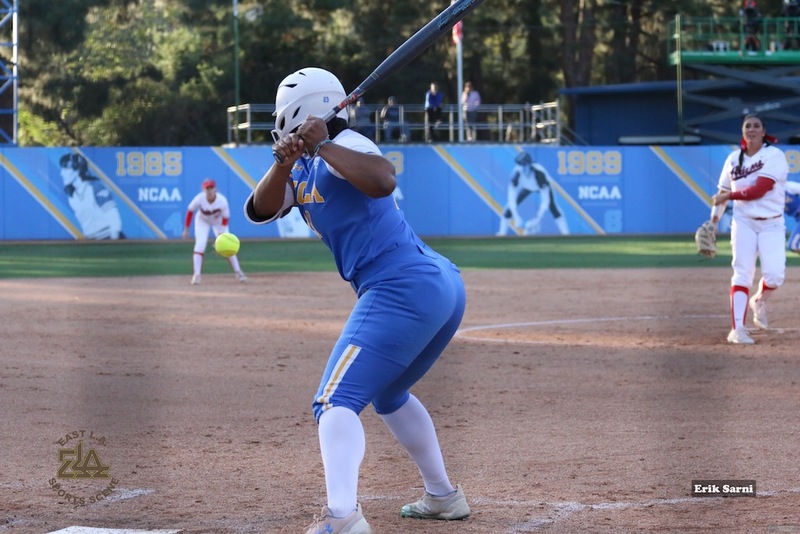 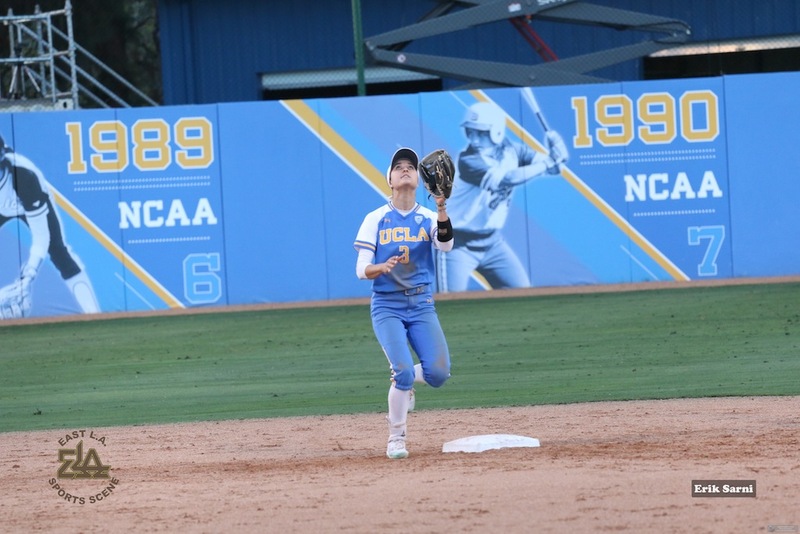 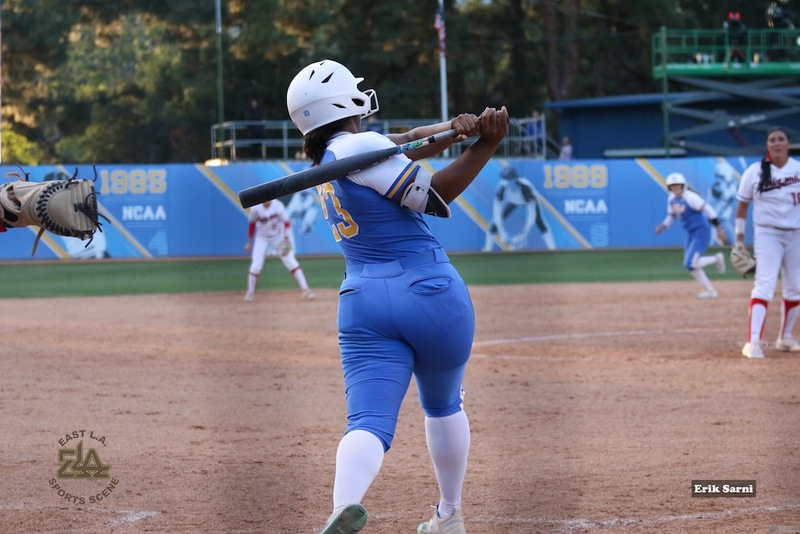 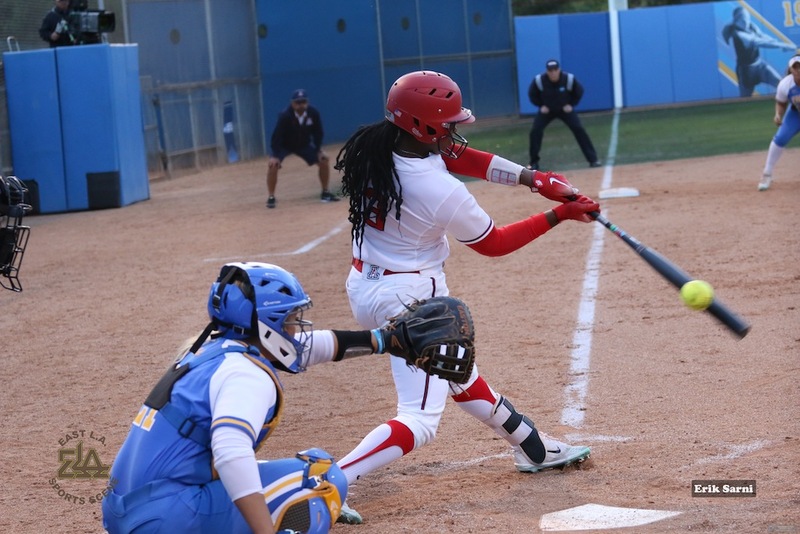 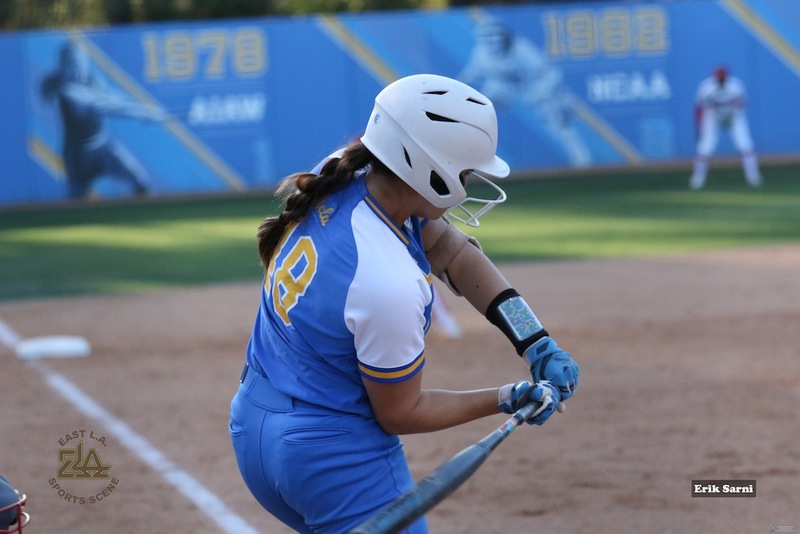 Bruin L.A. Super Regional Statlines: Bubba Nickles/4-7/.415/1 RBI/1 run; KyleePerez/3-7/.395/1 RBI/3 Runs; Aaliyah Jordan/2-5/.432/2 RBI; Briana Perez/3-7/.391/1 Run; Madeline Jelenicki/2-7/.247/3 RBI/2 Runs; and Rachel Garcia/2-6/.352/2 RBI/2 Runs. 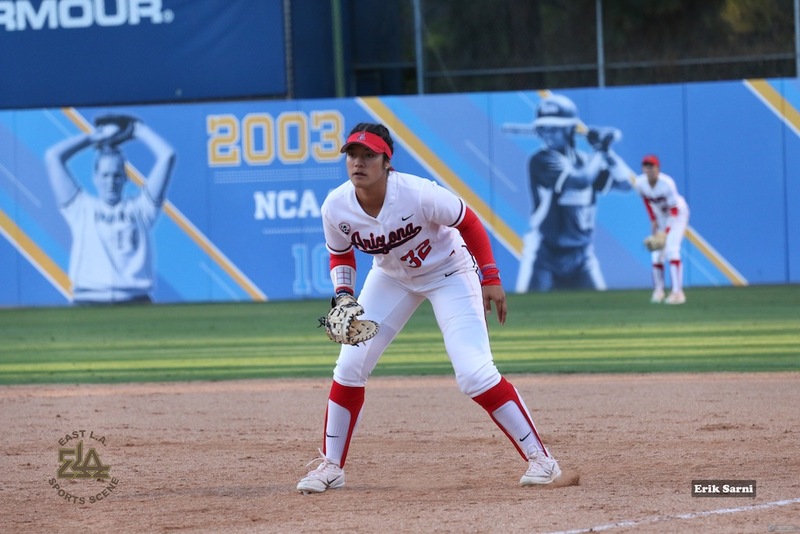 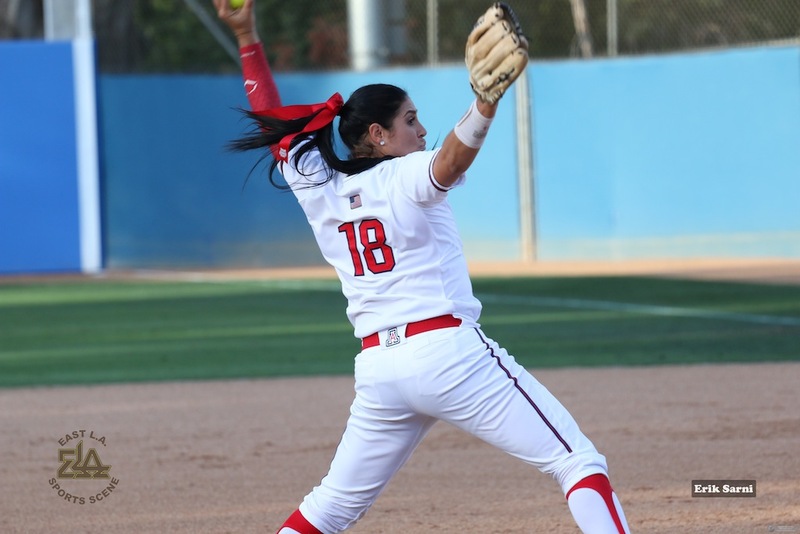 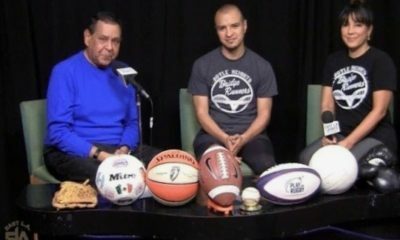 As the season accolades come in, Rachel Garcia has received the following: 2018 NCAA Softball Player of the Year; USA Collegiate Softball & ESPNW’s College Player of the Year; Selected To USA’s Softball’s National Team World Championship Roster; and the PAC-12’s Pitcher and Player of the Year.